TIP of the Week - Using your Stamparatus with your Project Kit! Did you ever stamp and the image wasn't dark enough or you didn't quite get all the the image inked. This happens to me and its ok if I can just cut another piece of cardstock but when I'm making a kit with prepared pieces, I don't want to waste any of them with a mistake. I made these cards from the Timeless Tidings Project Kit. I plan on using the Stamparatus to make the rest so I can be sure they are all stamped perfectly. Here are some tips for the circles. Punch out all the circles keeping the small and large separate. 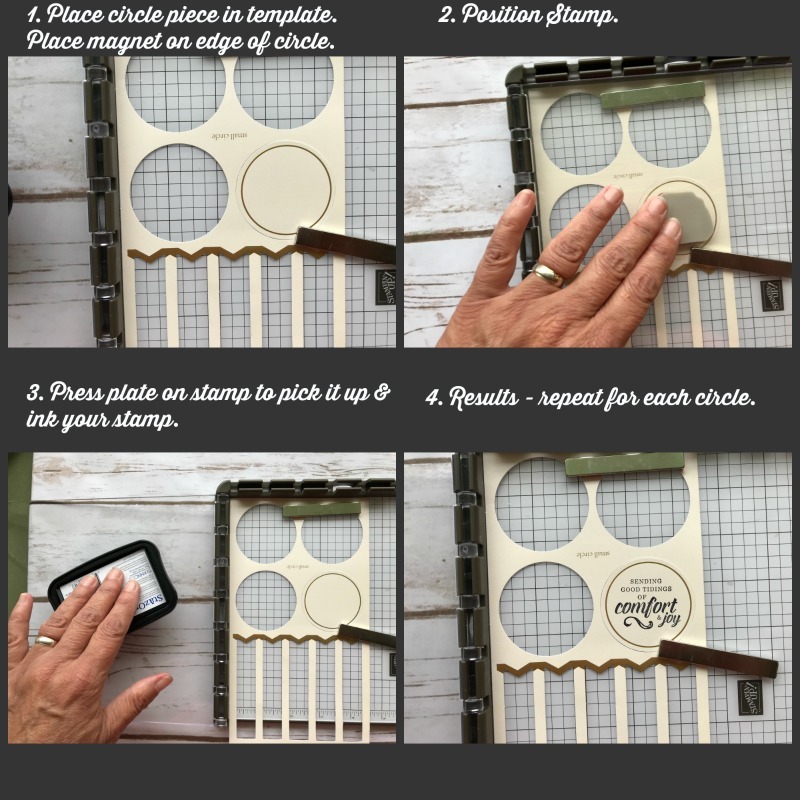 Use the leftover sheet as a template, placing the circle in one of the punch-outs and lining up the stamp just where you want it. Make sure you use the magnet on the edge of the circle because you won't want it to move if you have to re-stamp. Just keep adding your circles until all are stamped. For the banners, you can do the same; punch them all out and use the leftover piece as a template. The trick with this narrow banner is getting the Merry Christmas sentiment in just the right place. Using a piece of scrap paper, do some testing until you get it right and then remove the scrap, add the banner and stamp away. Come back September 5 and you can see the video I made with the Timeless Tidings Project Kit. You can also start ordering from the catalog. Let me know if you need a catalog!!! Older PostProduct of the Week - Timeless Tidings Project Kit!! !